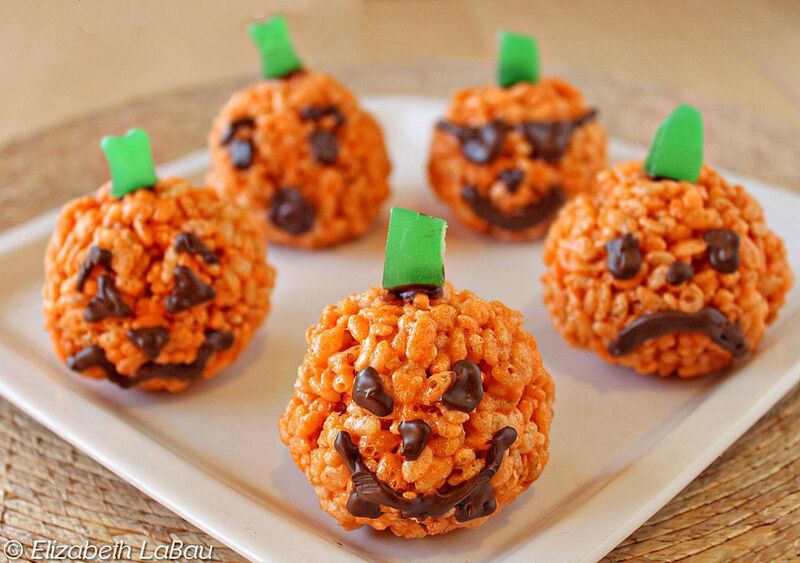 Rice Krispie treats get transformed into jack-o'-lanterns in this adorable Halloween recipe! These vibrant orange balls also make great Halloween decorations or party centerpieces. Experiment with different facial expressions to give each pumpkin its own personality. Place the butter in a microwave-safe bowl and microwave for 30 to 45 seconds to melt it. Add the marshmallows and microwave for an additional 90 seconds to melt them. The marshmallows might not look melted at the end of this time, but once you stir them, they should liquefy. Stir to blend the butter and marshmallows, then add the orange gelatin. Stir until the gelatin is well-incorporated: the mixture might look grainy at this point, but it will be okay once the cereal is added. Add the cereal and stir until it is thoroughly coated and there are no dry patches. Spray your hands with nonstick cooking spray and scoop up a handful of the cereal mixture. Press it firmly between your hands, forming a ball shape. Make sure that the balls are compact; loosely formed balls easily fall apart. If the balls don't ​form at first, allow the mixture to sit for another minute and cool, this seems to help them hold together. Place the Rice Krispie balls on the prepared baking sheet and allow them to firm up at room temperature. Once the balls are set, melt the chocolate chips in the microwave. Place the chocolate in a Ziploc bag and cut off a very small triangle from one of the corners. Using this decorating bag, draw jack-o'-lantern faces on the orange balls. While the chocolate sets, cut green your green gummies into thin stalks and attach them with a small amount of chocolate to the top of the pumpkins. Once the chocolate is dry, the pumpkins can be served or stored. Keep the pumpkin Rice Krispie treats in an airtight container in a cool, dry room.